The news that Thailand’s draft Biosafety Bill has been withdrawn from deliberation in the National Reform Council met with a lot of interest from different sectors of society, including those who approved of its withdrawal and those who were disappointed that the bill is not being carried through. There were many analyses and criticisms on different points within the draft, in particular the issue of liability and compensation (draft section 52), however I think that there are many other clauses which are problematic and am afraid may lead to a false understanding by the public. What has been written in draft section 52? The text I refer to is the draft text prepared by a Special Committee of Office of the Council of State (Krisdika) that was proposed to Parliament on 26th of June 2013, which I believe is the same text that was later submitted to the National Reform Council for consideration. Section 52 translates as follows: “in the case that there are damages arising to human or animal health or to biodiversity resulting from the operation of activities related to genetically modified organisms that are not registered as being environmentally safe according to this bill, those operators carrying out activities related to genetically modified organisms will be responsible for the payment of compensation and damages for the losses incurred. Except that in the cases where it is proven that the aforementioned damage arose from an unforeseeable event, or resulted from the actions of the injured party, companies operating with genetically modified organisms do not have to take responsibility” (emphasis added). The text in bold is of central concern in this draft clause. In the following article, for the term “genetically modified organisms”, I prefer to use the acronym GMOs. Is all text relating to liability and compensation for damages contained in a single clause? liability and compensation for damages. Even though this is only specifically written in one clause, when considering who will be held responsible if GMOs cause any harm, we cannot just look at section 52. Any analysis or judgement based on this single clause of the law will be inadequate. This draft law is complex and labyrinthine, such that if you read only one clause, it is virtually certain that you will be deceived. Why do we need to look at other clauses to understand the issue for responsibility and compensation? And it is only for damages from GMOs not registered as environmentally safe that anyone will be held responsible (see bold text of section 52 above). As for harm caused by GMOs that are listed as environmentally safe, the draft law does not cover this, which means that no one will be held responsible. Who will look after and compensate those who suffer damage from GMOs? In the case of damage arising from GMOs which are not registered as environmentally safe, those who release or allow the escape of GMOs into the environment will be held responsible, because such GMOs have not been authorised as safe. If such GMOs cannot be contained, or if they are not properly stored, the operators will have to take full responsibility, although an exception is made in the case where there is an unforeseeable event or if there was some oversight by the injured party as discussed below. Where harm arises from GMOs that are registered as environmentally safe, the law does not hold responsible in any way those who released these organisms into the environment. Therefore those who suffer the damages from this type of GMOs will have to swallow the consequences which they did not create, while those who release the GMOs benefit from their income, but don't have to take any responsibility. Why have GMOs been divided into 2 groups in this way? As far as I am aware, the division of GMOs into two groups does not have its origin in any laws of any other countries. I have studied the Biosafety laws of 20 countries around the world including the European Union. Every one of these specifies that someone must take responsibility in every case, without any distinction between GMOs which have or have not been registered as environmentally safe. In all cases when there are damages arising some party must be held responsible. So when we compare this with the Thai draft law, it is a little strange. What is the purpose of dividing GMOs into two groups? The way in which the law is drafted leaves no room for any conclusion other than that the intention was to allow those working with GMOs that are registered as environmentally safe to evade all responsibility. The distinction between GMOs is therefore like a trick used by those who drafted the law to lead people into thinking that there is an excellent level of strict regulation, while the specific clauses on liability are contained in a different part of the draft Act. It all looks convincingly rigorous. In cases where responsibility must be taken for damages, there is nothing requiring evidence that the company was negligent. This sounds good. It is beautifully written. But this tends to be too good to be true… Did they forget that there is nothing at all written about taking responsibility for the damages arising from GMOs which are registered as environmentally safe? Is it strange that companies will only be held responsible for GMOs which are not registered as environmentally safe? Actually this is not strange at all, it's just a little bit confusing and illogical. GMOs which are registered as environmentally safe are just as likely to cause harm as GMOs which are not registered as environmentally safe, except that in the former case, there is no need to take any responsibility. A law written in this way is likely to have a hidden agenda. And if our ecology, environment or biodiversity is damaged, what then? As already explained, in the case of GMOs which are not registered as environmentally safe, operators will certainly be held liable. However, where GMOs are registered as environmentally safe, it will fall on the government to sort out the problems and carry out all subsequent rehabilitation after the damage has been created. If that is the case, will this not impose a great burden on public finances? Of course. The state would have to spare some part of its budget (which is already very limited) to resolve the problems arising or restore the environment. In the past the national budget has never been enough for this kind of problem, therefore I am not so convinced that there would be a budget available for use in this issue. But the problem is not whether the budget would be sufficient or not, the problem is that companies who release GMOs and earn money from their operations, do not have to take any responsibility. Instead local people and nature have to take the consequences. This does not seem fair. If problems can be resolved, why should we worry? If we can resolve such problems, we should count ourselves lucky. But when then ecosystem, the environment or biodiversity is impacted, disturbed or damaged, it may be almost impossible to resolve the problems. For example, when the ecosystem is altered, certain animals or plants may disappear entirely. In some cases, work to restore the environment may take decades. Readers may remember the mercury poisoning in Klity Village - even today the problems are still not resolved. If there are problems that cannot be resolved, why do we allow GMOs? One group of scientists, who are supportive of GMOs, claim that they are entirely safe. It is worth noting that GMOs are commodities that can generate enormous profits, but their products have to be declared safe so that they can be sold. We cannot know if this is the reason why certain groups of scientists have shifted their position or not. Meanwhile there are other groups of scientists who see GMOs as a new technology, the full impacts of which humans do not yet know. If there are damages to the ecology, the environment, or to biodiversity, there may be no way to restore these to their original condition. They point out that scientists who support the use of GMOs are unable to guarantee that there are no dangers involved. Each side holds the other side responsible for showing evidence. So is the argument unresolved? How do we proceed from here? In fact, there is already an agreement on these issues at the international level, specifically in the Cartagena Protocol on Biosafety . This states very clearly that in the case of GMOs, the Precautionary Principle should be applied. That is, there's no need to wait for scientific evidence unequivocally to confirm that GMOs are harmful - if it is suspected or uncertain that GMOs will cause harm, it is justified to impose a prior ban on their production, import, use, or sale. In other words, the Protocol backs up the views of scientists who advise the use of the Precautionary Principle. Thailand is a signatory to this Protocol. What do international agreements have to say on issues of liability and compensation? The Nagoya–Kuala Lumpur Supplementary Protocol on Liability and Redress to the Cartagena Protocol on Biosafety does not stipulate that in the case of GMOs that have been registered as environmentally safe, no one is required to take any responsibility when damages arise. Furthermore, this Protocol reaffirms the Precautionary Principle. Do the international agreements make a distinction between GMOs based on whether they are registered as environmentally safe or not? The Supplementary Protocol states that it is a matter of internal laws of each signatory country whether they see fit to make any exceptions (Article 6 (2)) . From what I understand, the drafters of the Thai law are relying on this article in the Supplementary Protocol in their defence. However if you read the article carefully, it does not seem possible to rely on this article in this way. Article 6 of the Supplementary Protocol is related to exceptions - subsection (1) states that there is no requirement to take responsibility in the case of an unforeseeable event, or in the event of war, or civil unrest, and subsection (2) states that signatory countries are entitled to determine their own additional exceptions as they consider appropriate within their national legal systems. However, the exceptions in (2) for which it is not required to take responsibility refer to events, for example, in the case of negligence by the injured parties, (this is not specified in the Supplementary Protocol but is specified in the Thai draft law article 52). The Protocol never specifies that it is not required to take responsibility over certain types of GMOs. The drafting of the Thai law with a category exemption this way effectively contradicts the Precautionary Principle which Thailand has already formally signed up to. In my opinion, they are misguided. We mustn't forget that the law has been drafted in such a way as to exclude GMOs that have been registered as environmentally safe. This is even worse than ecological contamination. Therefore I am in agreement with those who criticise that the draft law aims to protect those who cause damage to the ecosystem more than protect the ecosystem. In conclusion, draft section 52 is deficient and must be redrafted. 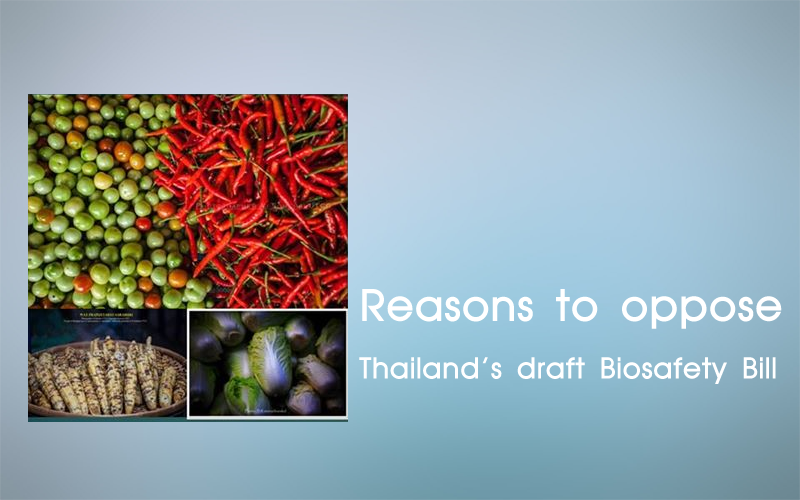 In sum, the Thai law should be redrafted in such a way that producers, importers, traders of GMOs, whether or not such GMOs are registered as environmentally safe, are required to take full responsibility where such GMOs cause harm. As for other issues, eg how broadly the term “unforeseeable events” should be defined, and the problem that this draft law does not genuinely apply the Precautionary Principle – let us continue this analysis at another opportunity.